ST. JOHN'S, N.L. 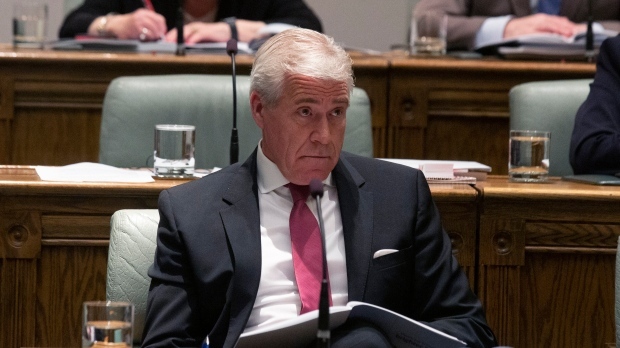 -- Premier Dwight Ball has called an early election in Newfoundland and Labrador for May 16, in what's shaping up as a close race between the ruling Liberals and opposition Tories. Ball made the announcement Wednesday evening in the lobby of the Confederation Building in St. John's after visiting the lieutenant-governor. He said the province is turning the corner toward a brighter future. "Our team is ready to build on our success," said Ball, surrounded by supporters. "Newfoundlanders and Labradorians are facing a stark choice in this upcoming election: it's onward or backward," he said. Ball's government tabled an optimistic budget Tuesday, with a lower deficit, nearly $600 million in infrastructure spending and no tax hikes. Recent polling suggests the Liberals are in for a tight race with the Progressive Conservatives trailing close behind and the NDP a distant third. The Liberals took power as frustrated voters booted the long-ruling Tories in 2015 but Ball's government has had a rough ride facing down a dire financial situation. The government has struggled to get its finances back on track after years of heavy deficits and concern over health care costs, outmigration and a rapidly aging population. The provincial election had been slated for October but the premier narrowed the window down in late March, promising to send voters to the polls before the school year ends. The standings at the dissolution of the legislature were 27 Liberals, eight Tories, two NDP and three independent members. The early election date comes close on the heels of some hefty government announcements -- most notably, the updated Atlantic Accord. The federal-provincial agreement on offshore resource revenues will see Newfoundland and Labrador receive $2.5 billion from Ottawa over 38 years. The federal funding gave the yearly fiscal projections a slight facelift in Tuesday's budget -- though the election call means the budget will not be passed before voters go to the polls. Finance Minister Tom Osborne has said the Liberal government will present the same budget if re-elected. The May voting date also means voters will cast their ballots before Ball testifies at the inquiry into the over-budget, behind-schedule Muskrat Falls hydro megaproject. Since last fall, former PC cabinet ministers and premiers have taken the witness stand amid testimony on alleged mismanagement that led to excessive cost and schedule overruns. Ball is scheduled to testify in July. Opposition members criticized the Liberal government Wednesday for calling an election early. The NDP and PC house leaders issued a joint statement saying the election date will cut short important government work like the proposed harassment-free workplace policy tabled by a legislature committee that has not yet been put to a vote. "This is in no way keeping with the repeated Liberal promise to govern differently and to reform and improve upon our democracy," NDP legislator Lorraine Michael said in the statement. Nevertheless, Ball's rivals have been poised and ready as rumours of a writ drop swirled over the past week, with a Tory campaign bus rolling into the parking lot of Confederation Building on Tuesday. Tory Leader Ches Crosbie promised tough love on government spending if elected, including possible measures to curb health care spending. "What we're missing, in a word, is leadership. It's leadership that makes the tough decisions, you're not going to please everybody," Crosbie said Wednesday. "While preserving the quality of (health care) you can root out a lot of waste." NDP Leader Alison Coffin said Wednesday her party is ready for the campaign, though only a handful of candidates have been officially nominated. She said she's confident nominations will be filled and she's been out meeting with voters in anticipation of the election call. "I've already started knocking on doors because of course, this is one of the worst kept secrets, really," Coffin said. Coffin said she's believes her party can be the change from the status quo that voters are looking for, despite their small presence in the latest legislative sitting. Ball spoke only for a few minutes Wednesday before exiting the Confederation Building with his Liberal caucus and nominees in tow. He touted his government's steady fiscal improvements while taking jabs at the Tories, criticizing their plans as unclear and insufficient to meet voters' needs.